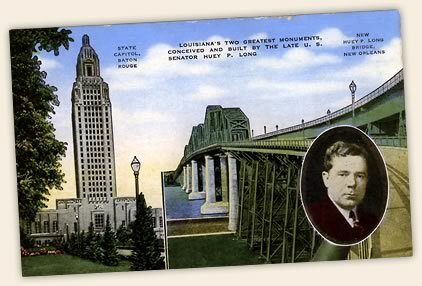 A cornerstone of Huey Long's programs as governor was his initiative to modernize Louisiana’s dilapidated — or nonexistent — infrastructure. Long built roads and bridges, schools and hospitals, and other public works. 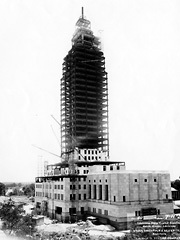 His improvements brought Louisiana into the twentieth century, as symbolized by the modern skyscraper State Capitol he built. 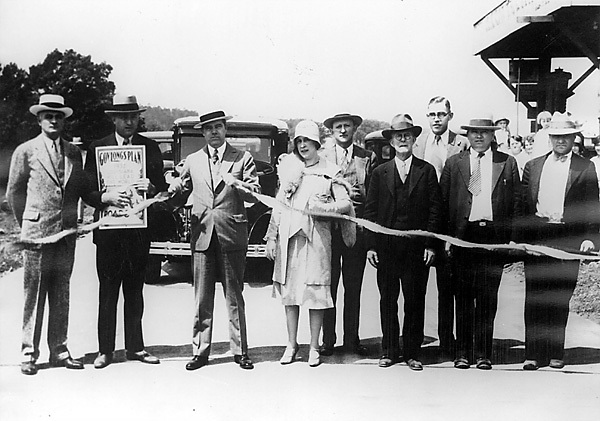 These bricks-and-mortar improvements made life easier, facilitated commerce, and put people to work. Long’s most visible contribution to the state’s infrastructure was his ambitious program to build roads and bridges, creating the state’s modern highway system. At his death, Louisiana had nearly 16,000 miles of paved and gravel roads and 111 bridges. In New Orleans, Huey Long constructed a seven-mile seawall around Lake Pontchartrain and built a modern airport. from Every Man a King by Huey Long; reprinted by permission. 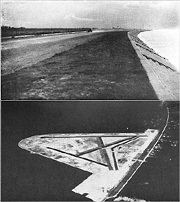 In New Orleans, Long constructed a seven-mile seawall around Lake Pontchartrain and built a modern airport, one of the nation’s largest. He also expanded facilities at Charity Hospital and the Port of New Orleans and piped a cheap supply of natural gas into the city and to other population centers. Long initiated the construction of public hospitals and schools. He tripled the size of Louisiana State University, building new department facilities and a modern football stadium, as well as a new medical school. 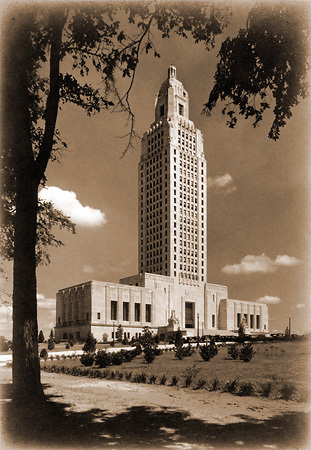 To accommodate the growing state government, Long built a new State Capitol building. The Art Deco-style skyscraper was the tallest building in the South. He also built a new Governor’s mansion modeled after the White House. Long asserted that the previous “termite-infested” mansion was not good enough for him, though it had been too good for his predecessors. 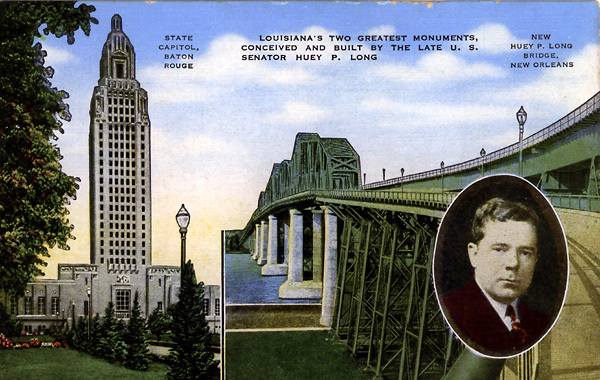 Postcard celebrating Huey Long's two greatest public works projects: the Louisiana State Capitol and the Huey P. Long Bridge over the Mississippi River. 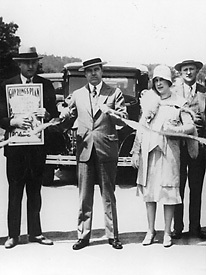 Huey Long and his wife Rose at a ribbon cutting ceremony for a new public works project. 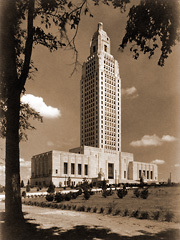 The Louisiana State Capitol, built by Huey Long's administration. 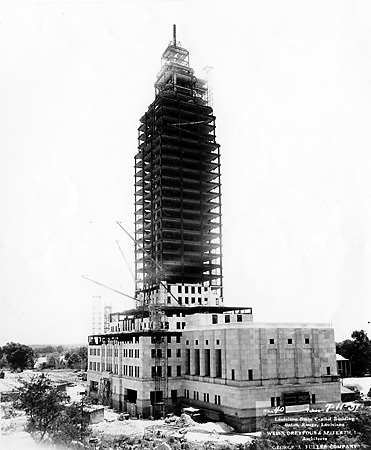 Construction of the Louisiana State Capitol by the Huey Long administration. 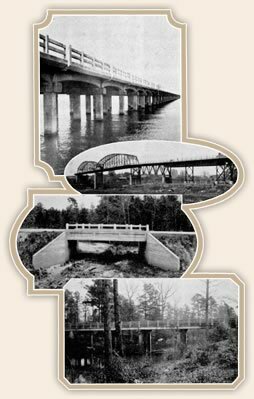 Louisiana highway bridges - the bridge at the top is a part of the five-mile concrete bridge across Lake Pontchartrain on the Old Spanish Trail near New Orleans. from Every Man a King by Huey Long; reproduced by permission.